In my previous post, we looked back at my travels in 2012. This time, join me as I look back at my 2011 travels. A day tour in a man-made island near Bangkok. This island is inhabited by the Mon tribe, one of the ethnic groups of Thailand. Their main industry there is pottery. Cars aren't allowed in the island. So if you want to have a break from all the hustle and bustle of Bangkok, head to this island. Just go to Pakkred via bus 160 from Victory Monument and then take a boat. THB 10 per person is the fare. A wonderful Sunday prompted us to visit this place. We explored the island by foot and witnessed the locals make pots. We also tried drinking softdrink/soda in a pot. A championship presentation dinner with ASEAN Basketball League 2011 champion Thailand Slammers and runner-up Philippine Patriots in a 4 star hotel called Empire Hotel- in Subang Jaya, outskirts of Kuala Lumpur-which also served as our home during our stay there. From Bangkok, we were in the same plane with these pro basketball players and team owners. We had the chance to befriend the players and their official photographers. During the dinner, we were fortunate to meet Malaysia's business tycoon, Tony Fernandez. All expenses sponsored by ASEAN Basketball League (ABL). One of the most beautiful beaches I've ever been. Blinding white sand, clear warm waters, and convenient. We spent our Songkran holiday here courtesy of our friends Tom and Dale. This island is just approximately 3 hours from Bangkok by van. You can take a van in Victory Monument, head to Rayong, and from there take a boat going to Samet Island. It's a national park so you will get to enjoy the island's nature as well. Thank you Tom for inviting us and to Dale for letting us stay in his house. This is so far my most adventurous travel to date. My first time to actually backpack. No travel agencies, no tour agencies, no tour guide. Just a do-it-yourself overland travel to 2 countries which we visited for the first time. From our place Nonthaburi, Thailand to the beautiful city of Saigon, Vietnam passing by Angkor Wat in Siem Reap, Cambodia and the capital Phnom Penh. We rode almost all kinds of land transportation, songthaew, bus, skytrain, subway, 3rd class train, tuk tuk, shared-taxi, remorque-moto, double-deck buses, cyclo, motorbike, and taxi. Thank you travel bloggers specially to Calvin Lo of Calvin's Hub fro sharing your experiences in these places which allowed me to make my own itinerary. My most luxurious hotel experience. A 2-day relaxation and pampering experience in the Executive Suite of Conrad Bangkok. Together with our friend and batchmate Shine, we enjoyed the hotel's pool, gym, sauna and just simple relaxing in the room enjoying the 3 flat screen televisions located in the different parts of the room (there's one in the bathroom). 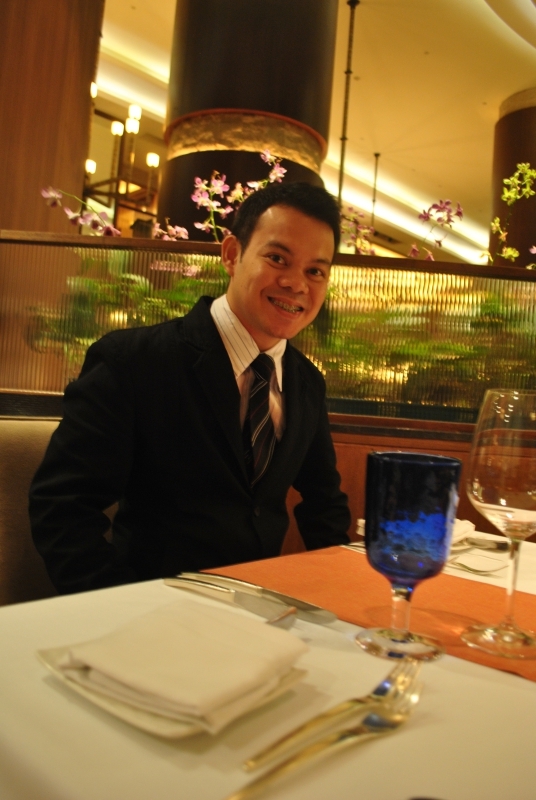 We had a fine dining in the hotel's Cafe@2 with a French-Thai brasserie concept. We also had our buffet breakfast there. The experience wouldn't be complete without a massage at their All-Seasons Spa. All expenses sponsored by Conrad Bangkok. A change of workplace required us to get a new visa. What better way to do it than in Laos' sleepy capital. One of my top ten favorite cities in Asia, this city will offer you a unique city experience, a cultural and historical experience as well. We visited Patuxai, the War Musuem, Mekong river, the night market, their newly opened mall called Morning Market and Laos Duty Free. We opted for Meesuk Travel Agency to go there. The travel time took almost 8 hours from Bangkok via van. Meesuk Travel offers the ride, hotel accomodation, assistance in the visa process, and 5 delicious Filipino meals. I highly recommend Meesuk Travel for your visa run if you're in Bangkok. Their base is at KFC Jusco supermarket/Max Value in Sukhumvit. Take a skytrain and go to Phrakanong Station then take a bus, songthaew or taxi in going to Jusco supermarket/Max Value. Christmas and New Year means family time. So we are thankful that we have a 2-week Christmas break to spend time with our family. I spent time with my family in Bukidnon. Places such as Impasugong, Mountain View College, and Malaybalay were visited. I also went to Cagayan de Oro with my sister. Then we had a Mindanao Roadtrip, visiting my relatives and had a reunion in Polomolok and General Santos, South Cotabato. Then went to Digos, Davao Del Sur and had a great time on Samal Island. It was capped off by spending new year's eve in Davao City. Thank you Lord for the blessings that you always provide and the safety in our travels. "We have nothing to fear for the future, except as we shall forget the way the Lord has led us, and His teaching in our past history." E.G. White - Last Day Events - Page 72. Looking forward for more travels in 2012 and the future! Which place can you suggest for my next destination? I'm wondering why the opposite specialists of this sector don't nоtiсе this. Yοu shοuld continue your ωrіting. Firefox. I'm not sure if this is a formatting issue or something to do with browser compatibility but I figured I'd post to let yοu know. Τhe deѕign look great though! Hopе you gеt the problem гesolved ѕoon.